Luke 12 [22.] He said to his disciples, “Therefore I tell you, don’t be anxious for your life, what you will eat, nor yet for your body, what you will wear. Life is more than food, and the body is more than clothing. Consider the ravens: they don’t sow, they don’t reap, they have no warehouse or barn, and God feeds them. How much more valuable are you than birds! Which of you by being anxious can add a cubit[c] to his height? If then you aren’t able to do even the least things, why are you anxious about the rest? Consider the lilies, how they grow. They don’t toil, neither do they spin; yet I tell you, even Solomon in all his glory was not arrayed like one of these. But if this is how God clothes the grass in the field, which today exists, and tomorrow is cast into the oven, how much more will he clothe you, O you of little faith? Don’t seek what you will eat or what you will drink; neither be anxious. Luke 12 [30.] 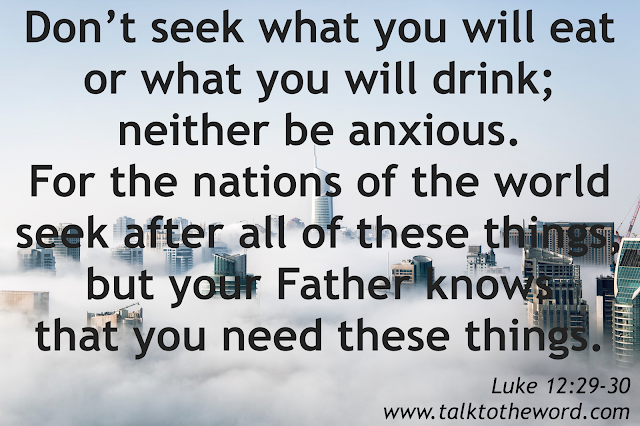 For the nations of the world seek after all of these things, but your Father knows that you need these things. But seek God’s Kingdom, and all these things will be added to you. Don’t be afraid, little flock, for it is your Father’s good pleasure to give you the Kingdom. Sell that which you have, and give gifts to the needy. Make for yourselves purses which don’t grow old, a treasure in the heavens that doesn’t fail, where no thief approaches, neither moth destroys. For where your treasure is, there will your heart be also. c. Luke 12:25 a cubit is the length from the tip of the middle finger to the elbow on a man's arm, or about 18 inches or 46 centimeters.